Discover the best of San Francisco with a visit to our hotel! 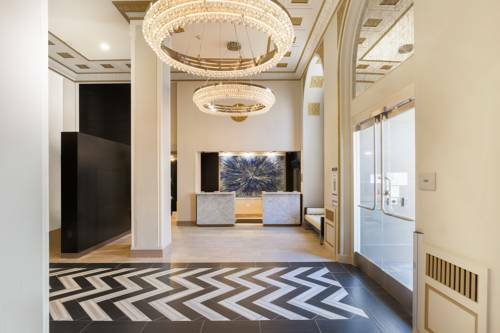 Ideally situated in a historic building just three blocks from Union Square and filled with outstanding amenities, the Courtyard San Francisco Union Square pays homage to the city's history while carving out a history of its own. Settle into one of our 166 beautifully appointed guest rooms, many of which offer scenic downtown views, and enjoy features like free Wi-Fi and luxurious bedding. Start your day here in the Union Square area with a workout in our fitness center, before enjoying a bite to eat and a cup of Starbucks coffee at Table 761, our hotel restaurant. Be sure to dine al fresco on our outdoor terrace, too. Explore San Francisco by cable car and visit nearby attractions like Ghirardelli Square and Fishermans Wharf and Metreon shopping center. If you're visiting for work, you can make use of hotel facilities including a 12-person boardroom. The Golden Gate City awaits; plan your stay here at the Courtyard San Francisco Union Square. Start your day with a variety of breakfast options and a Starbucks beverage at Table 761. After a busy day in San Francisco enjoy light fare and drinks at our hotel bar or relax on our patio. Open M-F 6-9:30am, Sat & Sun 7-10am, All days 5pm-10pm. ~2 miles from San Francisco. ~6 miles from San Francisco. Dog head sign from the last operating Doggie Diner has been preserved on a pole on the boulevard median. ~9 miles from San Francisco.